A new mobile outreach and support team is taking to the city streets to help the homeless. A collaboration between Hôtel-Dieu Grace Healthcare, Family Services Windsor-Essex, Canadian Mental Health Association Windsor-Essex County Branch and Assisted Living Southwestern Ontario, the mobile outreach and support team or MOST, consists of a driver trained to support those with physical disabilities, an outreach worker, and social worker. The team will provide a mix of supports including basic care needs, assertive outreach, advocacy and linkages to community supports. It will also make primary care connections with the aim to support long- term health improvements. The team will operate out of a multi-functional, accessible, van marked with each partner’s logo. As a pilot project, it aims to operate until June of this year from Monday to Friday from 5pm to 9pm. These hours were chosen because this is where there is a current gap in services. MOST will begin by traveling two designated downtown and west-end routes, stopping at popular locations identified by existing outreach workers who currently support their clients on foot. “The mobile function of this team is something unique that will make a big difference. Not only do we now have the ability to stock and distribute basic care needs like socks and food, but also provide a new opportunity of bringing services to this vulnerable population,” said Joyce Zuk, Executive Director at FSWE. 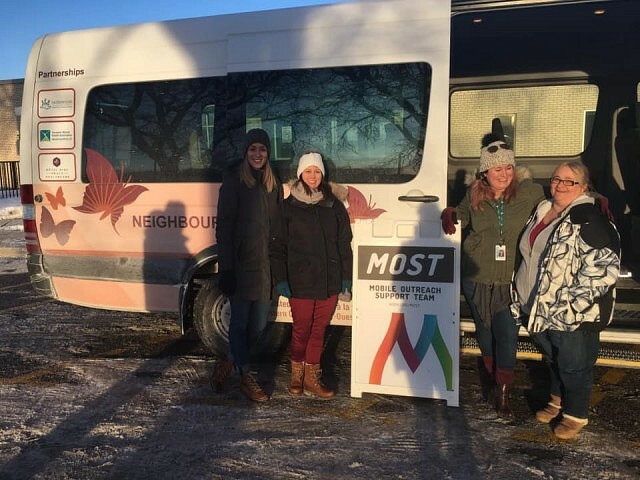 “By physically traveling to the client verses waiting for them to come to us, we begin to reduce traditional barriers to access like transportation, time constraints and distrust in the system.” Zuk’s team is providing MOST’s outreach worker. A complete listing of the route locations can be found here.